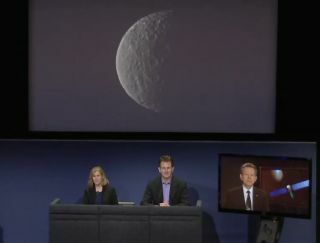 Deputy principal investigator for the Dawn mission Carol Raymond on left, and Robert Mase, Dawn's project manager, at a Jet Propulsion Laboratory news conference. PASADENA, Calif. — On Friday morning (March 6), NASA's Dawn spacecraft will slip into orbit around the dwarf planet Ceres. It's been a long journey for both the probe and the team of scientists and engineers assigned to the mission. The proposal for the mission was submitted in the late 1990s, said Carol Raymond, deputy principal investigator for the Dawn mission. "It's been a long haul," she told Space.com. "We've been through a lot of ups and downs to get to these two unexplored worlds." The Dawn space probe is getting humanity's best view yet of the tiny survivor from the solar system's earliest days. See what we know about the dwarf planet Ceres in this infographic. After spending 14 months surveying Vesta, Dawn was prepared to depart for Ceres — the largest body in the asteroid belt — using its low-thrust, high-efficiency ion engine. But one of its reaction wheels, used to stabilize the probe in space, had begun to fail just prior to arriving at Vesta in 2010. This was troublesome but not critical. Then, as the flight team prepared to depart the asteroid in 2012, a second reaction wheel began showing signs of ill health. By the time Dawn left Vesta's orbit, two reaction wheels had suffered crippling malfunctions. "We got a bad batch," Raymond said, referring to the reaction wheels. "They failed within a matter of hours or a day." With two of the four reaction wheels down, the $450 million mission faced a potential crisis. "That became a mission-limiting resource … We were using more hydrazine [the chemical used to fuel the spacecraft's thrusters] for maneuvering," Raymond said. "Because we have a fixed antenna, we are either looking at a surface, gathering data or turned towards the Earth to send it back. So, we have consequently had to reduce the number of turns, to be most efficient." Dawn is propelled through space by a cutting-edge ion engine, which uses a high electrical charge generated by its 65-foot-wide (20 meters) solar panels to expel xenon gas fuel at a high velocity. This creates a small but continuous thrust. The spacecraft can reach very high velocities over long periods of time. But for directional maneuvering and orientation, Dawn was designed to depend on the reaction wheels and, to a lesser degree, the hydrazine-fueled maneuvering thrusters. Her team will be bulking up as the spacecraft slowly circles into its science orbit, the altitude from which the onboard instrumentation can do optimal work. "Right now, the team is about 40 people, not including the science team," Raymond added. "The science team has about two dozen, and we are about to get a few new investigators from NASA. We also have large teams in Europe associated with the German camera and the Italian spectrometer [two instruments on Dawn]." Raymond is no stranger to cold and icy places, and is looking forward to investigating the two bright patches now visible on Ceres, thought to possibly be ice deposits. "I came to planetary science kind of late," she said. "My background was in Earth science. I did a lot of work in Antarctica, though, so ice is not too far afield!" "It's just thrilling," Raymond said. "This is truly the highlight of my career."